Mariyappan Thangavelu won India’s first gold medal at the Rio Paralympics. He won the gold in the Men’s High Jump T-42 event with a leap of 1.89 metres. 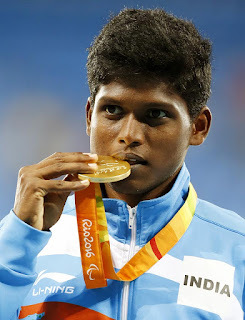 With this, Thangavelu also became the first Indian high-jumper to win gold at the Paralympics. This was India’s overall third gold at the Games and the first after 12 years. In addition, Bronze in the event also went to India through Varun Singh Bhati, who jumped his personal best of 1.86 metres to finish third. USA's Sam Grewe bagged the silver medal. India had claimed a Gold and a Bronze at Athens in 2004. Javelin thrower Devendra Jhajharia had then won the Gold, with Rajinder Singh claiming the Bronze in powerlifting. In the last edition of the Games in London, India had attained just a Silver. India had won its first ever Paralympics Gold in the 1972 Heidelberg Games through Swimmer Murlikant Petkar.